Hello lovely readers, I hope you all had a great weekend! On Saturday Dan took me to see the new X-Men film. I've loved the X-Men since I was little so I was super excited to go and see it. So I thought I would share what I thought of X-Men Apocalypse. I've kept any spoilers out so if you haven't seen the film this post is still safe to read. 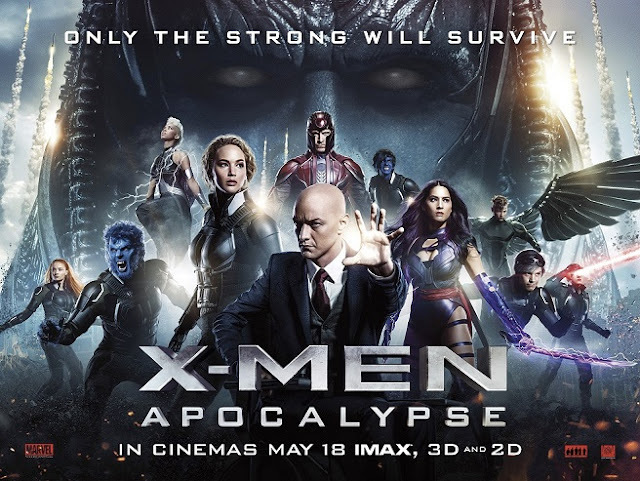 The film takes place in the 80s, a being who is believed to be the first mutant (Apocalypse) has awoken. After seeing what the world has become Apocalypse decides to gather four mutants (his horsemen) in order to cleanse the world. So it's up to Professor Xavier and his students to stop Apocalypse. The storyline is a little same old same old: villain tries to destroy the world, it's up to the heroes to stop them. But for a superhero movie you can't really expect much more. It may be a overused storyline but the characters help give it new life and make it more interesting. As always Michael Fassbender is amazing as Magneto who is enlisted by Apocalypse to be one of his horsemen. Michael Fassbender shows the two sides of Magneto's character really well and makes his pain and anger so obvious. Some of Magneto's scenes made me want to cry. He definitely was the highlight of the film for me, plus you get to hear him sing! Swoon! I think this was James McAvoy's best performance as Professor X, he plays the character and his never ending hope in mankind perfectly. Sophie Turner (Sansa Stark from Game of Thrones) did a good job playing a young Jean Grey even if her American wasn't too great. I loved the return of Quicksilver's character as he provided much of the film's humour but wasn't overbearing. OK so now for an unpopular opinion, I don't like Jennifer Lawrence as Mystique/Raven, I feel she comes across as too whiny and not badass enough (like Mystique is meant to be). I also don't like how the films put so much focus on her and how they are trying to replace Hugh Jackman's Wolverine with her. Dan hated Apocalypse's character probably because he didn't look or sound anything like how he does in the 90s cartoon, which we both love (see here). I didn't find him too bad as a villain he was quite sinister and frightening and the actor did a good job of playing him. On a whole I liked the film but it didn't leave a lasting impression on me. It was just an OK way to spend a few hours. I hope you enjoyed my review of X-Men: Apocalypse. Have you seen this film? What did you think of it? I really need to get back into X-Men, I've never seen any of the newer ones! I definitely recommend them, I was skeptical at first as I love the old cast so much but they are pretty good! Thanks for stopping by! i'm so glad someone shares my feelings about Jennifer Lawrence as Mystique. I'm not the biggest superhero movie fan but even I was disappointed and confused about why she's always centre stage. I feel that because she has such a huge fan base the film makers are using her just as a way to get fans to flock in whether she's good in the role or not which is disappointing. Thanks for dropping in! I really really really want to see this!!! I haven't seen it yet, but it is on my list to see. Apocalypse is one of my favourite story lines in X-Men so I'm pretty sure I'm either going to hate it or love their take on it. I love J-Law but totally agree with you... I'm curious, how do you feel about Channing Tatum as Gambit?? I'm really angry and nervous about that one personally hah! I love the Apocalyspe story line too, let me know what you think when you do see it. Ugh I am seriously not impressed with the idea of Channing Tatum as Gabit! I don't see how they thought that was a good idea! Thanks for stopping by! I loved Gambit and Rogue they are two of my favourites (the films ruin Rogue!). I would recommend the films they are pretty good! Thank you beautiful lady I hope you are ok and everything is well with you! I'm going to watch it this weekend. I hope you enjoy it! Thank you! Thank you! I hope you enjoy the film when you see it. Thanks for popping by! For someone who has no idea whatsoever about the X-men, I really liked this movie! To me, Jennifer Lawrence as Mystique did not stand out at all, mostly compared to Michael Fassbender and Sophie Turner. I feel like the movie was really explained for new people that came to watch this movie, although I am SO, SO curious as to what are Jean's powers. I'm really glad you liked the film! Michael Fassbender and Sophie Turner were really good! I think they are going to into Jean's powers a lot in the next film. Thanks for stopping by!